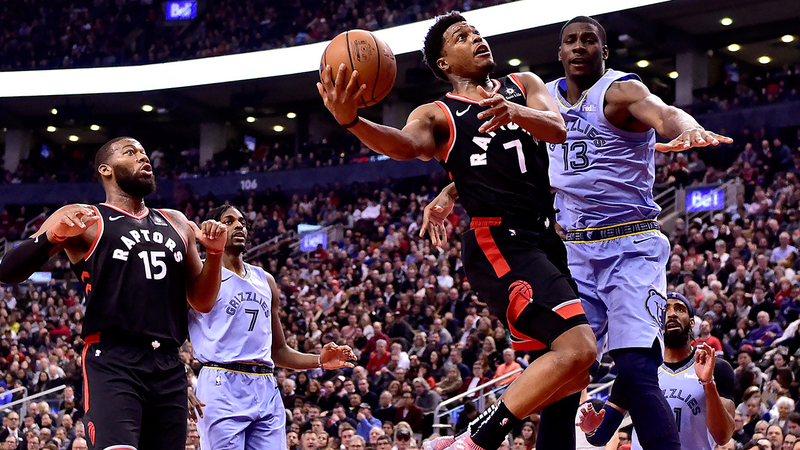 The Toronto Raptors took care of business at home once again as they defeated the Memphis Grizzlies 119-90 on Saturday. Danny Green led Raptors scorers, and made all of his eight field goals from three-point range. Green shot 8-12 from three, and 8-13 overall, he also grabbed seven rebounds. Serge Ibaka scored 18 points, Pascal Siakam had 17 and also brought down eight boards. Norman Powell scored 14 off the bench, C.J. Miles had 13. Everyone who was active on Toronto’s roster played minutes, including Patrick McCaw who scored his first points as a Raptor. Memphis were without Joakim Noah due to personal reasons, and Marc Gasol who was dealing with a sore back. Jaren Jackson Jr. led Grizzlies scorers with 16 points, he grabbed nine boards as well. Shelvin Mack scored 14 off the bench, while Ivan Rabb recorded a double-double off the bench as he scored 13 points and grabbed 11 rebounds. The Raptors out-assisted the Grizzlies 31-21, Kyle Lowry and Fred VanVleet had seven each. Danny Green scored a season-high 24 points, and hit seven three-pointers in a row in the third quarter. Kawhi Leonard did not play in this game, and will rest his third game in a row when the Raptors host the Sacramento Kings on Tuesday night at Scotiabank Arena.